What a tremendous blessing it is to have good health, to have the energy and ability to go about daily tasks and enjoy simple pleasures! Periodically, I have been adding information to a health journal of sorts. The post has gotten so tediously long that I decided to give it a fresh start in this new post today. Click here to view the original post if you’d like to read about appreciating your health, hypothyroidism, food obsessions, motivation to exercise, diet plans, health-related jokes and videos, Oxycise, essential oils (especially frankincense), or shrinking tumors and scars. I went back and labelled the sections to make it easier to find each topic. My hubby and daughter have spurred us all into a lifestyle change (hopefully)! What began as a five-day raw-vegan experiment has been expanded into at least a 45-day plan intended to change our diets for the long-term. 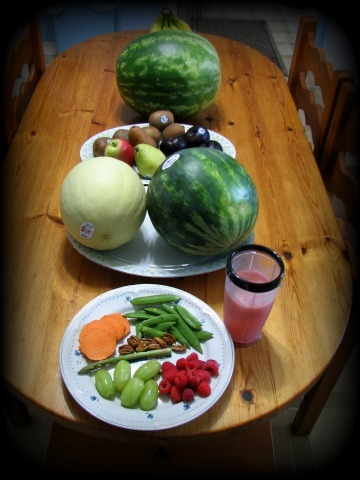 For five days, we ate only raw, whole fruits and vegetables, along with some nuts and seeds. By the end of day one, my husband’s stomach was smaller and softer (meaning less indigestion), and his recently-acquired ulcers had stopped bothering him. (By the way, a spoonful of honey or a few ounces of aloe vera juice will help heal ulcers if taken a couple of times per day.) By the fourth day, I had much less hypothyroid “brain fog” and more energy. My daughter, who had been experiencing headaches 4-5 days per week for the last month, had not a single headache after going on the raw vegan diet. Lifetime plan: Limit meat, salt, sugar, & artificial additives; eat until satisfied, never “stuffed;” & stay away from anything that caused problems when reintroduced. My husband wanted to reintroduce dairy as soon as possible, but I talked him into pushing it farther down the list to keep it out of our systems longer. I have suspected for years that I have a slight problem with dairy, and he may, too, since he craves it as much as I do. I’m expecting that dairy is the main culprit adding to my health problems, and it will probably have to be permanently eliminated for me. Here’s hoping I’m wrong! We began this journey on May 1st, so right now we are in the middle of step #2. So far, I’m feeling better and more energetic each day! (I should mention that, in addition to the dietary changes, I’ve been taking walks, gardening, and doing Oxycise 3-5 days per week.) I may stop the diet plan at #8 and limit the rest to holidays and vacations, if I have them at all. I truly want to be healthier and feel better! We began eating fish today (step #7), and things are still going quite well. We regretted combining soy and wheat on step #4, so we tried each one for 3-4 days and pushed the addition of eggs back a day. I’m thrilled to note that I did not have any noticeable problems during the five days of eating dairy. I dedicated a couple of days to cheese and a couple to milk and had no problems. Hooray! So now I’m guessing my past problems from hypothyroidism and exhaustion were related to junk/chemicals, salt, &/or simply overeating. We’ll see as the experiment progresses. My husband’s stomach seems to disagree with having cheese in it (milk did not bother him at all), so he plans to limit it in the future. Other than that, none of us have had adverse reactions to anything we’ve added so far. I’m also excited to say that although I have not kept up with my exercises as often as planned, I am still gradually losing weight while eating about as much as I could want each day. The only times I’ve gained a pound were when we made a creamy cheese sauce for pasta, and I “cheated” and added too much salt to my plate. More fresh fruits and veggies the next day helps shed the water weight, though. This has been interesting, and so worth it! My husband is exploring processed vegan foods. My opinions: Wheat hot dogs = disgusting! I couldn’t get one bite down! Wheat/veggie burgers = not bad at all, as long as the cook isn’t distracted when the grill suddenly flames up and chars one side of them. Lol Falafel “meatballs” and falafel chips = wonderful! I personally don’t care to go any further with the experiment, but I will continue to support my family (or else I’ll be in big trouble with my daughter! ha ha). Since we finished with homeschool last week, I’m really enjoying venturing into the garden in the cool of the morning for fresh breakfasts of sugar snap peas, strawberries, raspberries, edible flowers, and carrots. Blissful! The diet experiment is over, and the results are in. The basics I’ve learned are that brazil nuts don’t like me at all if I eat a handful on an empty stomach, dairy (surprisingly) doesn’t seem to bother me, and sugary junk makes me feel gross after going two months without it. I was weak and craving sweets today, so I gobbled down two sour cream cake doughnuts and a glass of chocolate milk. I feel like I could throw up. I don’t know why I caved and bought that today. I know it’s not good for me! I want to make processed, sugary junk food a thing of the past and take better care of my body. I want that bursting energy and clear-mindedness back that I had the first week or two of our healthy-eating experiment! “If you have found honey, eat only enough for you, lest you have your fill of it and vomit it” (Proverbs 25:16). The second half of 2016 has flown by! As far as diet, I’ve been keeping sugar intake low and incorporating whole foods into my diet every day (when I can keep my family away from restaurants! It’s so tempting!). After several months of laziness and working on special rotator cuff exercises for my injured shoulder, I’m finally getting back into an actual exercise routine this last month. Setting aside time first thing in the morning is definitely the best method for me to make sure I actually complete my exercises each day. Using Oxycise breathing methods and simple cardio and body weight routines for 20 to 40 minutes, 5-6 days per week, has made a huge difference in my body composition and energy level. It’s been 15-16 months since I injured my shoulder (possibly tearing the deltoid muscle), and it’s still not quite back to normal. I quickly learned not to push that shoulder to the level of discomfort at all when exercising and not to think “It’s well enough now to use it to lift this 50 lb bag as long as I mainly lift with my strong arm…” Nope, that doesn’t work because I reinjured it and set myself back several times over the past year. After babying it for months, faithfully doing rotator cuff rehab exercises, and taking L-Lysine* and Vitamin C, I’m to the point now where I can use the shoulder enough to begin building muscle back onto it. I’ve looked a little funny with the overused, healthy shoulder being full and round, while the injured one looked like a bony knob. I’m cautiously on the way to evening out now — hooray! Remember: Always modify exercise moves that aggravate an injury or push you past your flexibility or fitness level! That’s all for the moment. Please check back later for more updates, and please share your own tips and stories in the comments below!